The New Consistometer Model E utilizes high precision torque cell technology to measure the viscosity of Newtonian and non-Newtonian materials. Designed to meet a broad range of viscosity testing requirements. Improved measurement range and precision, reduces operator error and offers unbiased results. Quick disconnect sensors facilitate easy clean up and changing of the sensors. Temperature can be measured and displayed via an optional Pt100 temperature probe. Controls and measures speed at fixed intervals or may be programmed to interpret shear dependent flow behaviors with the protocol design and data transfer option. In the Food Industry the instrument is used to evaluate a wide range of materials for the laboratory, production and quality control. Its application can be used to measure apparent viscosity and perceived difference in the flow properties of fluids, pastes, slurries and semi-solids with particulates. It may be used to characterize the flow behavior of materials and to predict consistency, processing ability or stability. The Consistometer Model E offers a wide measurement range, from a few centipoises up to 700,000 centipoises. The unit offers a menu driven electronic keypad and display for ease of operation and observation of data. The robust, rugged design is well suited for the toughest production and/or laboratory environment. 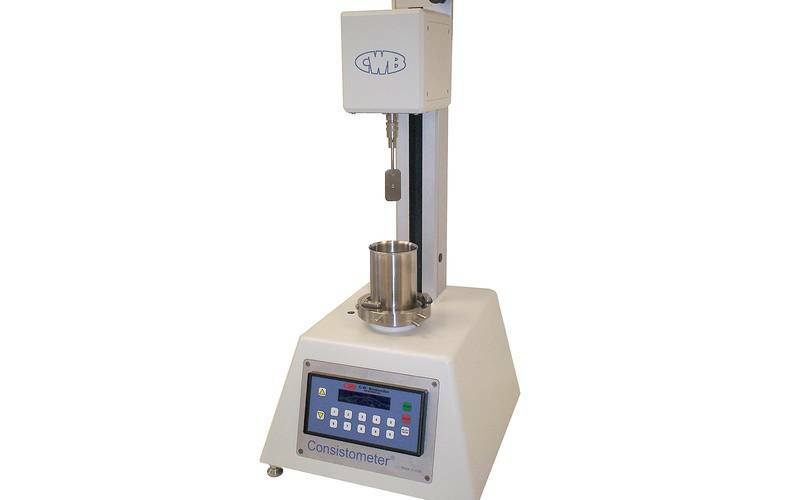 Whether you use our standard bowl or your own specific product can --- the Consistometer E was designed for complete flexibility and will provide apparent viscosity measurements at room temperature. Optional equipment, such as water circulators and other accessories will allow you to investigate your product at fixed or programmed temperature rates to mimic actual process temperatures and conditions. The Consistometer has been a standard instrument in measuring thermal processing of cream styled corn, as well as baby food and chocolate for crystallization measurements. We invite you to share your applications so you can benefit from our many years of laboratory testing experience. The Consistometer uses reaction torque for dynamic measurement. Reaction torque is developed by submersing a sensor element in a rotating sample vessel containing the test material and measuring the resultant torque expended by the material on the sensing device. The torque is measured in units of either Centimeter-grams (cm-g) or Brabender Units (BU). The measured torque, time and speed data can then be utilized to calculate the apparent viscosity and characterize the flow behavior of the test material.